The QQI Training Needs Identification and Design course is an excellent choice for teams that need to be able to identify training requirements and design training modules or full programmes successfully. Over 3 days, our trainer will take your team through best practices for assessing training needs and creating engaging training. Upon completing the training and passing the accompanying assessments, your team will achieve a QQI Level 6 certification. What are the benefits of running this Training Needs Identification & Design course in your organisation? One of the main benefits of in-company training is the opportunity to adjust the existing course content to focus on the elements of training needs identification and design that your participants will need the most. We can refocus the content to refer to your business and its training challenges. Training an entire team at once provides a common language, skill-set and level of competency throughout. This ensures that those who are trained by or within your business will receive the same standard of service at all times. Identifying training needs and analysing them to determine the goals and objectives of training can be a tricky process. Having completed this QQI Training Needs Identification and Design course, participants will be competent and confident in conducting a full training needs analysis. Being able to design an engaging training programme or module around objectives is a valuable skill for any trainer. We teach participants how to create training that is both enjoyable and effective. Once delegates have successfully completed and passed their assessment work, they will achieve a respected QQI Level 6 certification. 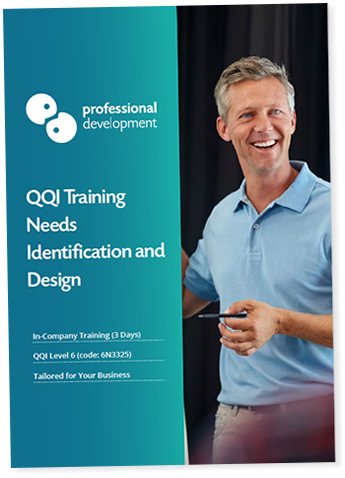 What is covered on this QQI Training Needs Identification & Design Course? Training Needs Identification and Design is an excellent and beneficial course in its own right. It is also hugely effective when combined with its partner course, QQI Training Delivery and Evaluation. Successful completion of both courses and the accompanying body of assessment work will earn participants with the QQI Special Purpose Award in Training and Development. It’s an excellent continuous development programme that will enhance other areas of performance and boost team morale. Training Needs Identification is ideal for anyone who works in HR, or has a requirement for identifying and analysing training needs for others. It is also very beneficial for anyone who trains others regularly. What is the QQI code for this course? The QQI code for this courses is 6N3325. It is placed at Level 6 on the National Framework of Qualifications (NFQ). First, participants must complete training. Next, comes a period of self-directed learning and assessment work. We will provide each participant with an assessment brief and guidance for self-directed learning during the course. All assessment work must be submitted 8 weeks after the last training date. The work is then evaluated, and successful candidates will receive their QQI certificate within 5 - 6 months of submitting their work. I don’t want to organise in-company training. Can I attend a public version of this course? Yes, we run Training Needs Identification and Design as a public course, open for individuals to attend. Click here to read more about the public course, and get our schedule of dates.